OIE Joint Collaborating Centre for Food Safety seminar will be held in the C1-202 class room of Rakuno Gakuen University from 18:00 on Friday, February 9, 2018. 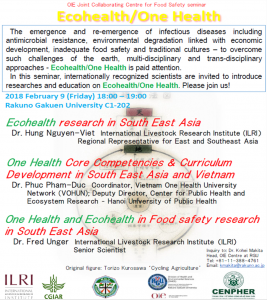 At this seminar, three experts from Vietnam will give a talk about Echohealth and One Health. Please refer to the poster for details. It is a valuable opportunity. We are waiting for the participation of many people.